High Performance Billing – How Landmark Improves your ‘Bottom Line’. Efficiency is adversely affected when one gets paid by the time spent and not by the quality of the work. Human nature and scientific studies support this. 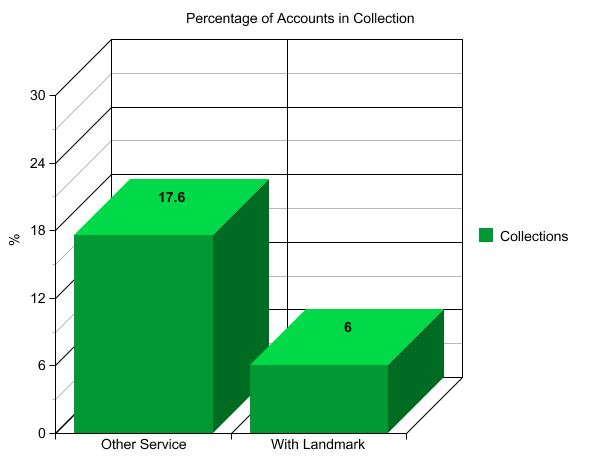 The dollars billed-to-collected ratio of in-house billing averages under 76%. Landmark receives money only when the insurance claim is paid or when the patient’s account is settled. This performance-style fee increases the client’s income because Landmark receives nothing until the client does . . . Landmark has to do a better job! CAUSE: Many In-House Billing Departments Do Not Bill Secondary or Tertiary Insurance Carriers and Most Departments Bill Insurance Only Once or Twice per Month. Billing only primary insurance companies causes incomplete insurance payments and frustrates patients because they receive a statement incorrectly indicating that a balance is owed. Many patients express their anger at their care providers and sometimes tend to discontinue using this care provider. Insurance companies start the payment process when they receive the claim so untimely billing greatly slows the cash flow to the client. Each and every claim is billed electronically to each and every insurance carrier everyday. Patients receive correct statements and care providers receive their money quickly.